If your conversation ever veers into Hamburger territory in this part of Kentucky, someone will inevitably mention Dovie's in Tompkinsville. Dovie's Cafe has been around since 1940 and it is famous for one thing: Deep-Fried Hamburgers. You order your burger squozed or unsquozed -- the squozed burgers have some of the grease pressed out before it is slapped on the bun. This place has been on my list since the beginning of spring, and I finally had a chance to ride there today. Knowing that I was going to eat one of the most unhealthy lunches imaginable, I decided an early workout and a skipped breakfast might help offset the damage. 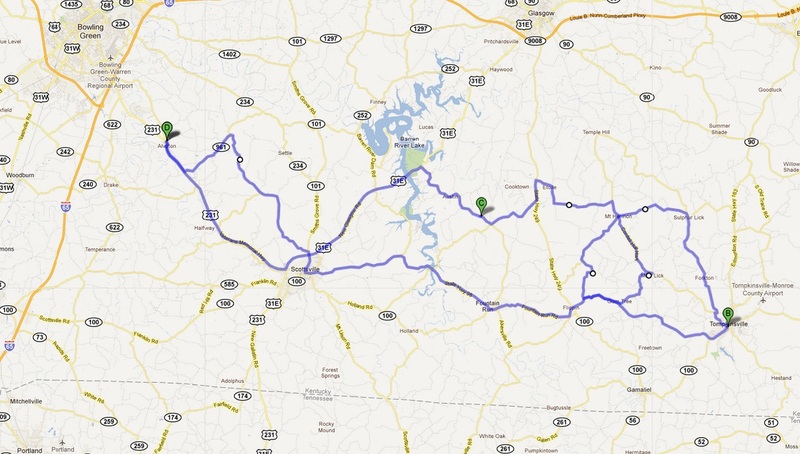 That was dumb, and I sure was hungry when I got to Tompkinsville. And that's where I suffered my first Food Ride Fail. Was it an Epic Fail? Nope! But for awhile I thought it was. And it would have been if a wrong turn and The Country Bakery didn't save my day. [TANGENT: In my opinion, the term Epic Fail has been overused in recent years. There is always a lot of fail happening out there, and that's normal. An Epic Fail should be truly epic (i.e., monumental). The only recent example I can think of happened during the 100th running of the Indy 500 earlier this year. Rookie JR Hildebrand found himself in the lead of the race with only three laps to go. He had already negotiated 788 corners successfully, so he had to navigate only 12 more to put his face on the Borg-Warner trophy in his first attempt. Things just aren't as green as they were a couple months ago. Mo's Grocery in non-existent Halifax, KY. You can get a good fresh Burger there, too. Pitstop for gas & air in Scottsville. The sign says this is the East Mud Lick Church of Christ in Mud Lick, KY. I spent a good portion of the day wondering if there is actually a West Mud Lick Church of Christ? Hey, look, there's Dovie's! Say, why is the parking lot empty? To make things worse, I did get to watch them fry up 12 Burgers that I couldn't have. I like their operation, though -- all the work is done in the middle of the joint so you can watch your Burger be made, assembly-line style. Three vats of soybean oil on the right, and a counter top to slap everything together on the left. And that's it. Simple! That's the last Burger of the day being squozed. Torture. Documentation -- they really do close at 2:00 PM. I think they felt sorry for me, so they offered to sell me a hot dog (deep-fried, of course). I almost finished my milk before closing time. Closing time means they are going home, so you are leaving. Sure, I'll be glad to get the lights! All you need to know about Dovie's is this: THEY CLOSE AT 2:00 PM ON SATURDAY! And by 2:00 PM, they really mean 1:30 PM -- if you're not there by 1:30, you are not getting a Dovie Burger. This looks like a step back in time. After this last pitstop, I made a wrong turn and my day took a turn for the better. I decided to just go East until I saw something that looked familiar. This is why I have the 'No GPS' rule! I chose right, and it was the right choice. I stumbled upon some fun roads, for sure. I don't know what this was, mostly because I don't know where I was, but it looked like good clean fun. And there it is --The Country Bakery, one of my favorite food places. So, this is where my Epic Fail became a regular everyday fail. I'll take it! What did I learn from this? When all else fails, find The Country Bakery -- they'll fix it. They make pizzas in there. Donuts and all that bakery stuff, too (but by 3:00 PM on Saturday the donuts are long gone). If you can prove it's your birthday, The Country Bakery will bake you a Personal Pizza like this one for free. Paradise Point. If I wanted a hot dog I would have gone there. I still hope to spend a whole day there before the summer ends. UPDATE (6/8/12): I'll admit to holding a grudge against T-ville since that August '11 failure, so I tried to put it behind me today and go back for my Dovie Burger. Another fail. I got so lost on the way there that I can't even illustrate my path on a route map. My bad. Somebody is re-opening this gas station and building a store complete with a deli. Sweet. They close at 4:00 on Fridays. Headin' home... with a bunch of BBQ. UPDATE (5/31/14): Well, it took awhile, but I finally got that burger! If the original post had a negative tone, I apologize because these ladies couldn't have been nicer. Turns out that if you get here in time, you will get your Dovie burger. By the looks of things, you might not always get a seat, but you'll get a burger! V-Twin horses at Fountain Run, KY.